Yesterday was a big first for our little guy. He got to go to the movies for the very first time. Ok, maybe it depends on what you call big...but I think it is a big deal for his little life. We have not been to the movies but maybe 1-2 times since Perry was born and have been looking forward to the days when he is big enough to enjoy going to the movies as a family. 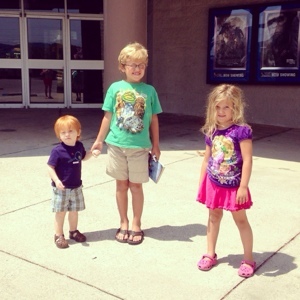 Aunt Emily invited us to go see Rio 2 with Ben and Kate and her yesterday. It was playing as the $1 movie at Hollywood 18. Actually Perry was free since he is so young...so it was $1 for both of us. Talk about a cheap date. I figured even if things went terribly wrong and we didn't stay the whole time, it wasn't a big investment. But he did great. He sat in our lap and watched most of the movie and would get up and walk around and play a little too. Snacks and drinks from home also helped keep him sitting and occupied. He got just a little squirlley right at the end and we left for a few minutes for a diaper change and to run around just a little, and then went back in for the last couple minutes. But overall he really enjoyed watching the movie and all the songs and animals...it was right up his alley. P is quickly transitioning from baby to little kid and it is opening up opportunities for so many fun things to do. After the movies we had a fun lunch at Jason's Deli with the Eckleys before naptime and a much needed haircut for Perry. I am happy to report that he now looks much more boy and can see out of his eyes. Funny story. 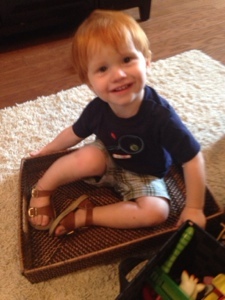 Later in the day he was playing in the living room and pulled this wicker tray off the coffee table, sat in it, and declared it to be a boat. It made my laugh so hard. I love seeing him use his imagination.